Omega-3 supplements are touted for their positive effects on numerous health conditions. You may find combination supplements of both omega-3 and vitamin D; however, omega-3 doesn't contain vitamin D. What the nutrients may share in common are beneficial roles in bone health -- a bona fide characteristic of vitamin D and a possible one for omega-3 fatty acids. Omega-3 fatty acids are essential polyunsaturated fats derived from foods such as fatty fish and nuts and found in supplement form as fish oil. The two types of omega-3 fatty acids in fatty fish are EPA and DHA. Omega-3s are believed to reduce inflammation in the body, providing beneficial effects for the heart and other parts of the body. Research has only confirmed omega-3's effects on lowering triglycerides and its positive role in heart health. Further research is needed to confirm its role in other health conditions. Vitamin D is considered a nutrient and a hormone because you can obtain it from foods, but also generate it in your body with skin exposure to the sun. Sources of vitamin D include egg yolk, liver, fortified cereals and milk, and supplements. Vitamin D plays a positive role in bone health, and possibly in immune function, heart disease and in reducing cancer cell proliferation. 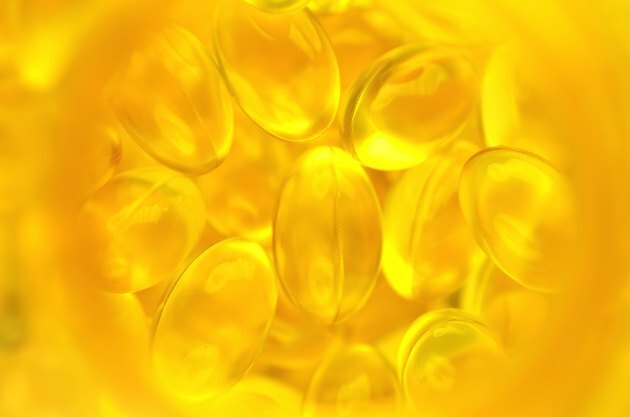 Cod liver oil, a supplement rich in omega-3 fatty acids, also provides beneficial vitamin D. A tablespoon of oil contains 1,360 international units of vitamin D, or slightly more than twice your daily intake requirement. Vitamin D's main role in the body is allowing normal absorption of calcium. Normal calcium absorption is required for bone density and strength. A lack of vitamin D can cause the bones to weaken and become more likely to fracture, a condition called osteoporosis. A lack of vitamin D can also cause the bones to become soft and deformed, a painful condition called rickets in children and osteomalacia in adults. Omega-3's role in bone health is tenuous and requires more research. However, a 1998 study in the journal "Aging" found increased bone density when EPA was taken alone or with calcium. MedlinePlus lists fish oil as possibly effective for osteoporosis. Omega-3 fatty acid supplements sometimes cause gastrointestinal symptoms such as burping, fishy aftertaste, indigestion and heartburn. To minimize these symptoms, refrigerate the supplements and take them with meals. Vitamin D supplements are often recommended for people who have limited sun exposure and who are more at risk for deficiency, including obese and darker-skinned people. Excess vitamin D can cause toxicity and is linked to high supplement intake, although the Harvard School of Public Health believes these claims are overstated. The Institute of Medicine recommends most adults obtain 600 international of daily vitamin D. Omega-3 and vitamin D are sometimes combined and offered in a single supplement. Before you begin taking these supplements, discuss safe dosing levels with your doctor.